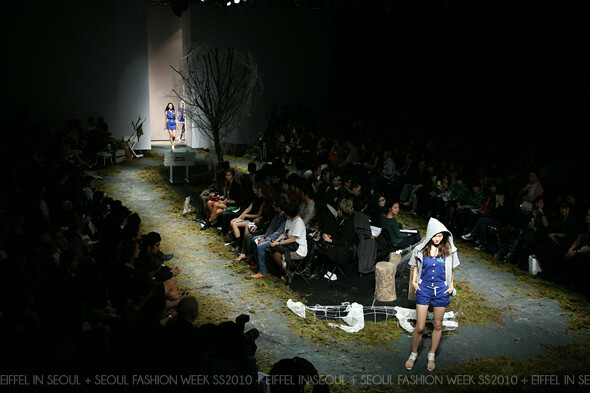 Steve J & Yoni P held its Spring/Summer 2011 fashion show at Seoul Fashion Week on October 24, 2010 at Setec Hall 3. Members of girl group, T-ara (Eun Jung, Boram, Qri and Ji Yeon) and After School (Nana and Lizzy) were seen at the fashion show. The four members of T-ara were spotted wearing matching leopard print sweaters which I really dislike. They looked incredibly tacky.. or should I say, they have always looked tacky. Compared to T-ara, After School's Nana and Lizzy were looking great wearing navy and black dresses, respectively to the show. After School's outfit sells for me, I would buy the dress after seeing it on them but I can't say the same for T-ara. What do you think? Shouldn't it be the Spring/Summer 2011 show instead of 2010? Yes it is, whoops! Still stucked in "2010". The rare green sweatshirts, rain boots, striped tights. I can save Eun Jun, I like the hat! Fantastic Nana, I want that dress! like t-ara but not their style or fashion choices. they desperately need a new stylist.